Like many European capitals, there are many things to see and do in Brussels that wouldn't possibly fit in just one day. 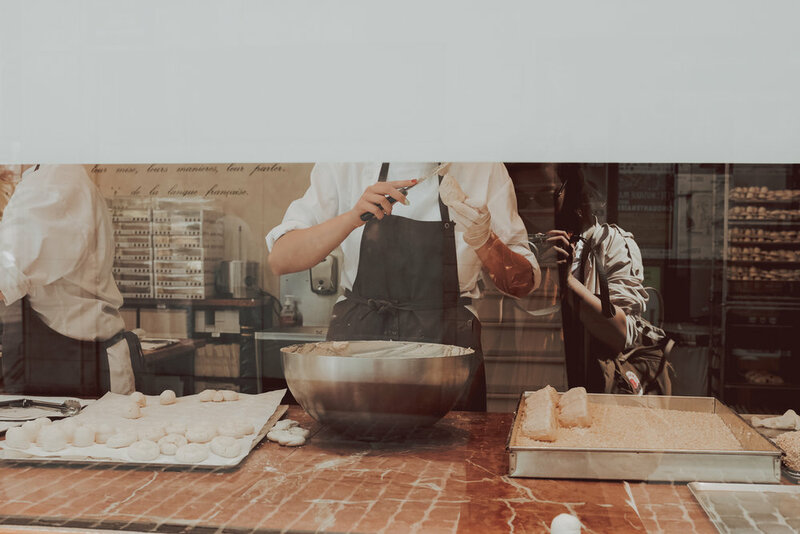 But if this is your first time visiting and you are short on time, or maybe you are on a day trip to Brussels from Antwerp - or other nearby cities - and only have one day in Brussels, this is the itinerary for you. 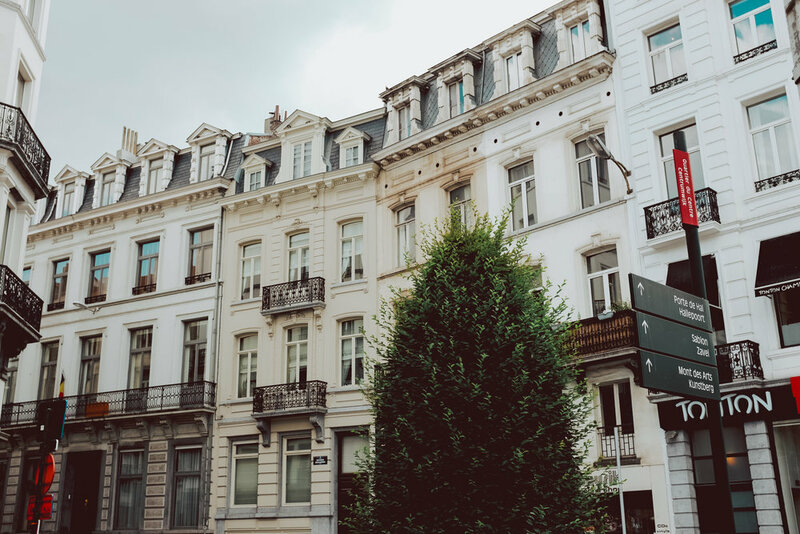 Whether you arrive by plane or train, most likely you will end up at Brussels-Midi train station - which leaves you near the city center, a great starting point. Settle down in your hotel first if you are planning to stay overnight, if not, then let's begin our day. First stop, Manneken Pis. Upon exploring the intricate streets, I ended up in front of the petit statue. I wasn’t sure what was going on at first, seeing a large crowd of what I could have only guessed were tourists, frantically taking pictures pointing at the same direction. After taking shade under one of the bakeries, I finally noticed little Julien aka Petit Julien aka Mennen Pis. I found the most exciting part of the statue was the outfit. With an array of clothes designed just for him, you may find it entertaining -what will he be wearing when you visit? If you love Manneken Pis, you may also enjoy Zinneke Pis and Zinneke Pis (a girl peeing, and a dog peeing) - commissioned after the popularity of a boy peeing. Now that we are done with the "Most disappointing tourist attractions in the world," let's move on to more exciting things! Brussels Grand Palace is the most iconic landmark in the city and a UNESCO World Heritage Site since 1998. The square, located in the city center, is surrounded by the city's Town House, Maison du Roi, and opulent guildhalls. Every two years, the Tapis de Fleurs - or Flower Carpet - creates an impressive motif of flower that takes up most of the square. The event only lasts a few days, but if you are lucky and visiting during those days, it will be a great treat. Check out when is the next Tapis de Fleurs event here. Brussels' cobblestones streets are full of charm. All the alleys that lead to Grand Place are filled with boutique, waffle shops, and chocolatiers so take your time to explore around. Whether you are one day in Brussels or a week, you can't leave without trying Belgium chocolates or having a waffle - or 10, I won't judge. The thing about Belgian waffles is that they are crispier and richer in taste compared to the American version, top it off with creamy Belgian chocolate sauce, and you will have perfection. 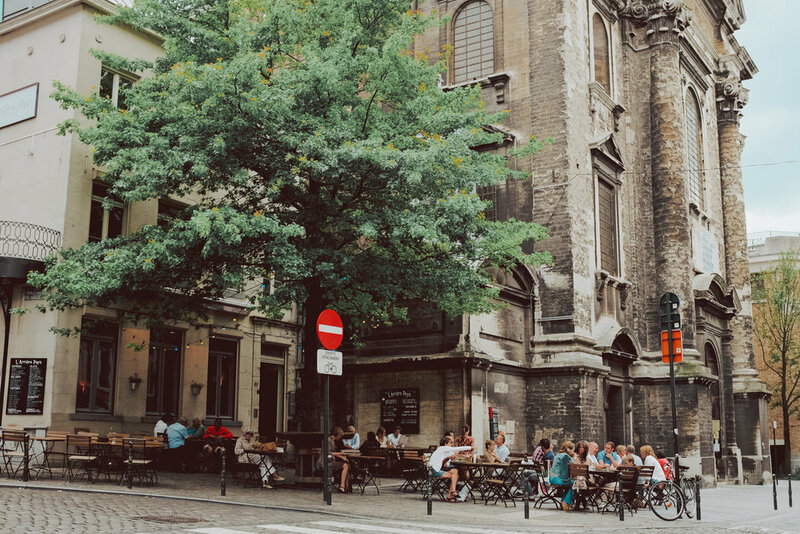 There is such a big coffee culture in Brussels that you're likely to come across a coffee shop on every corner. When I need a break from all the walking, I usually do so at a coffee shop. I order a delectable pastry with an invigorating latte to sip away. If you are staying overnight, check out the coffee shops for a delicious breakfast. L'Atelier en Ville is a very unique and eclectic shop that you cannot skip. When you step in, you may wonder what exactly is it, but worry not. L'Atelier is everything - a boutique, a coffee shop, a furniture store, a garden, an art store, everything. I found Cafe Du Sablon by accident when I was just walking by. The coffee shop is a nice place to sip on a coffee or a matcha latte overlooking the church. Cafe Capitale takes their coffee seriously. Grab a coffee and sit outside to enjoy some people-watching. MOK offers more than your usual cappuccino and latte. The coffee shop is a hit with visitors and locals alike for their great hot beverages and ambiance. They also offer vegan options. It's an excellent place for a quick coffee break. The location may be small, but it serves coffee packed with great flavor. Peck 47 is best known for its breakfast - egg benedict on croissants, waffles, or salmon yummy - but you will also find a great cup of coffee here. It may get busy, but that's only a testament to its popularity. Chicago Cafe is another place known for its breakfast but also a great spot for a coffee break if you are nearby. 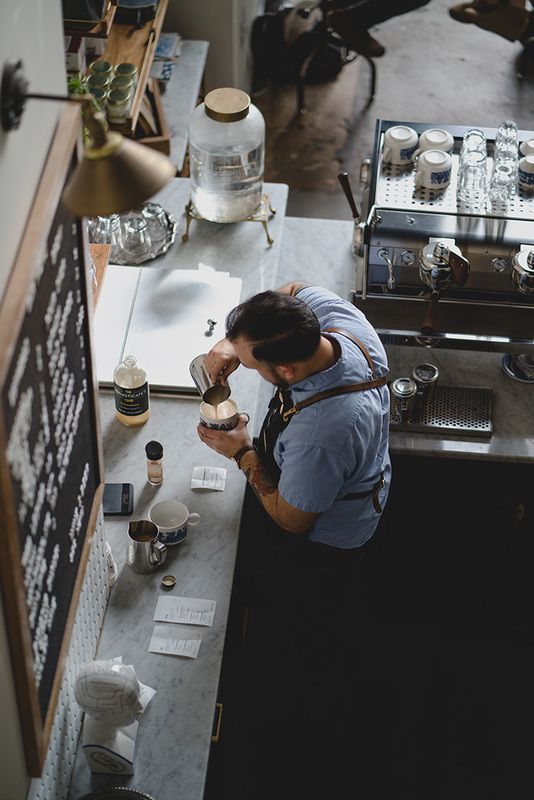 Tip - Favorite the list of coffee shops on your Google Map. As you wander around and the need for a coffee break hits you, find the nearest coffee shop. I love parks, especially when the weather is so lovely! It was a no-brainer for me to stop at this beautiful park. I entered through one of the gates and immediately, the smell of flowers hit me. It was so wonderful to walk around and see people having picnics, lying on the grass reading while others meditate. I sat on one of the benches and started looking at people walk by. Right in front of me was a gazebo. I envisioned a group of people dancing inside, to 1930’s classic hits. If you love visiting parks, also check out Jardin Du Petit Sablon and Parc du Cinquantenaire. Who doesn't have a thing for Royals and their palaces? Tour the Palais De Bruxelles and check out the grand salons and decor. Although the monarchy no longer resides in this edifice, it's still a place where the king conducts his affairs of state and ceremonies. Yes, book a tour! Visiting Brussels in one day, means you are short of time. Why not let a local expert tell you more about their beautiful city and get the most out of your day trip. I love going on walking tours or experience tours. To end your day trip to Brussels, savor Brussels culinary scene! I decided to try my luck and showed up early to one of Brussels' hip restaurants without a reservation. Upon arrival, the hostess looked through the book and luckily found a spot for me, but kindly advised that they would need the table in two hours - plenty of time for me to enjoy dinner. She sat me at a table for two towards the back of the restaurant; more privacy and an unobstructed view of the kitchen and restaurant. The place started to fill with locals and the smell of delicious food. Tip: Even with only one day in Brussels, make sure to try Moules-Frites! From the airport, there is an express train that takes you to the city - Bruxelles Midi - and vice versa. Buy a two-way ticket if you are planning to head back to the airport for a reduced price. Go on a day trip! Antwerp it’s only a short train ride away from Brussels. Check out my post on Antwerp: 5 Things To Do in Antwerp On a Day Trip.